War for the Planet of the Apes – 4K Ultra HD Blu-ray review | What Hi-Fi? The final film in the new Planet of the Apes trilogy is a fine one - but what did we think of the UHD treatment? War for the Planet of the Apes brings the story of Andy Serkis’ Caesar to a close - it's an intelligent, mature piece of work in a series that's made huge strides in bringing motion-captured visual effects into the realm of photorealism. Both Rise and Dawn for the Planet of the Apes slipped onto 4K Blu-ray earlier this year, so how does War fare on the format? War begins two years after Dawn, with the apes retreating further into the forest after Koba's (Toby Kebbell) attempt to start a war opened a bigger rift between Man and ape. Caesar sets his sights on finding a new home for the apes but is struck by tragedy when a squad of soldiers (led by Woody Harrelson’s Colonel) attack. Vowing revenge, Caesar wrestles with his darker instincts as he goes on a journey to kill the Colonel. Rupert Wyatt's Rise of the Planet of Apes did a great job of reinvigorating the series after Tim Burton’s shaky 2001 film. Dawn saw Matt Reeves inherit the director’s chair and deliver a confident sequel that improved on the first. War feels emboldened by previous successes -it's a measured and rousing film, confident in its ability to tell a story from the perspective of the simian population and not rely on the human characters as much. It has the feel of a rugged Western, with a few references to Apocalypse Now as well as Biblical allusions and a second half that plays like The Great Escape. It strikes a more thoughtful tone that you'd expect from a summer blockbuster, and Reeves handles the story with care. He's content for the film to take its time and delve into Caesar’s struggles than pummel the audience with action scenes. That it is able to focus on Caesar is thanks to the fantastic motion-captured visual effects, which are even better realised than before. The apes looks incredibly natural and don't feel out of place, helped by the film shooting in real locations rather than on green-screen stages. The actors drive the performance - Serkis is again terrific as Caesar grappling with his grief while confronting his own demons. He brings out a darker side only teased in Dawn. It’s hard not to love Karin Konoval’s Maurice, who radiates wisdom and empathy. Steve Zahn’s Bad Ape lightens the melancholic tone and is absolutely adorable, while the likes of Terry Notary, Alessandro Juliani and Michael Adamthwaite provide enjoyable support. There aren't many roles for female characters, something the series has struggled with since Rise. Amiah Miller’s Nova (one of several refences to the original Apes series) has the biggest and, despite being mute for the entirety of the film, she has some lovely interactions with the apes. The human side of the conflict is mostly represented by Harrelson and Gabriel Chavarria's Preacher, and the relationships built here are decent. They add a bit of depth and mystery with regards to how the story eventually unfolds. If you’re expecting huge, cataclysmic battles, then adjust your expectations. What war there is bookends the film and isn’t primarily the focus. Perhaps what the 'war' refers to is the internal one raging within Caesar - in that respect, it's an engrossing watch. This is another upscale to 4K release and it is an improvement over the HD Blu-ray. It is a sharper, slicker image, with detail easier to pick up - whether it's the fur of the apes or textures of clothes and the locations. Whites look cleaner too, though we find there is more of a bluish hue in some scenes on the 4K transfer we don't notice in corresponding scenes on the HD Blu-ray. War has plenty drab greys and browns that help maintain the film's realistic tone, but what colour there is pops off the screen. There's a touch more colour in the complexions of characters, clothes and the surrounding environment. The 4K version has the ability to go just that bit brighter, with the scene of Caesar and the apes riding down the beach just a shade more vivid. The use of colour is subtler too, with more gradations and tones available that make for an attractive watch. Highlights appear more refined where (to our eyes) they seem to stand out more. We'd say this is a more precise, better-looking image. If you have a large 4K TV this will look very good on it. As soon as the 20th Century Fox logo makes its entrance, the Atmos track kicks into gear by neatly suspending the famous fanfare (performed with congo drums) in mid-air. What follows is a scene where the military encroaches on an ape trench, a scene where there's an extra bit of height to be described before it expands and adds environmental sounds that place the viewer in the thick of the action. It’s a sign of how the track intends to proceed. War is often quiet and contemplative, allowing for a more atmospheric sound-scape to take centre stage. Whether it’s the sounds of the ocean you hear lapping away during Caesar’s journey or the rustling of fabrics and the sound of something just beyond a door, it’s a track that builds a sense of immersion. It doesn’t draw attention to itself, instead decorating neat little sounds around you. There’s a nice balance of detail (with some nice activity in the rear speakers), clarity and atmosphere. The track is pretty deft with dynamics, able to go from quiet to loud seamlessly. Dialogue is clear throughout and delivered crisply through the centre channel. Giacchino’s emotional and rousing score comes through the front speakers, but sounds larger and occupies a bigger space than expected. It works brilliantly during the camp sequence where Caesar defies the Colonel and the music swells, engulfing the room and adding to the emotion of the scene. 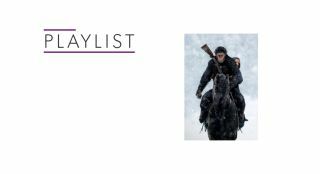 It's not a soundtrack that intends to be in your face (we're tempted to call it wistful) but there's a sense of energy and calm about it - it's a thoughtful effort that underscores the action and drama of a scene rather than applying brute force. War is a rousing finale for this part of the Apes series. It lacks the action the title implies, which will put some off. However, it continues the good work achieved by Rise and Dawn with an intelligent take that's morphed what may have been seen as a hokey series into a worthy one. The 4K disc is superior in terms of image quality to the HD disc in some subtle ways. The Atmos soundtrack is naturalistic and does a great job of placing you within the action. The film comes recommended - and if you have a big 4K set, this film will knock your socks off. There's a insert for a digital copy and another advertising Alien: Covenant 4K and Kingsman: The Golden Circle, which are heading to UHD early in the New Year. Special features for this release come on the Blu-ray disc. Director Matt Reeves' commentary appears on both the UHD and Blu-ray disc.